There is a lot of negativity about public health care, the delay of the new Children’s Hospital and also issues at Fiona Stanley, so it’s good I can write something positive about it. My experience yesterday at the Fiona Stanley Hospital emergency department was nothing but perfect as far as my treatment was concerned. The young Irish doctor was extremely thorough in asking questions, to the point that I wondered why my GPs rarely ever ask such probing questions. The nurses were also very efficient, professional and very easy going and I have nothing but praise for the department, its delightful staff and the gentle care they gave me. The system might be flawed but definitely not where the medical staff is involved. They are pretty perfect, so thank you very much to all the people who looked after me yesterday! About 30 people protested this morning against the closure of the Emergency Department of Fremantle Hospital. Labor Member for Fremantle Simone McGurk was there, as was Shadow Minister for Health Roger Cook and MP Melissa Parke. The department closed at 7 this morning, the same time as the new emergency department at the Fiona Stanley Hospital opened in Murdoch. Strangely at 11 am one sign to the emergency department there was still covered and roving reporter Gideon Digbey told me there were no significant signs to Emergency on South Street and Murdoch Drive. The Emergency Department at Fremantle Hospital closed at 7 am this morning. It has been fenced off and workers were changing the signs. Freo residents and visitors will now have to drive to the Emergency Department of the new Fiona Stanley Hospital in Murdoch if they need urgent care. 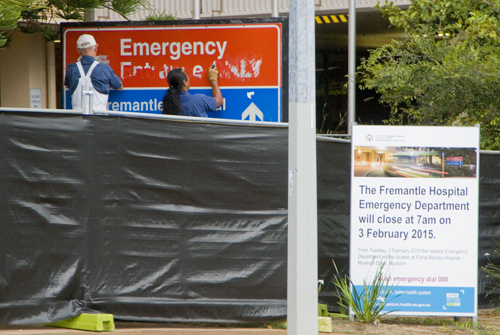 The downgrading of Fremantle Hospital and the closure of the Emergency Department is in full swing today. A fleet of ambulances are transporting patients to the new Fiona Stanley Hospital in Murdoch all day today. Motorcycle police are doing the traffic control on the corner of Hampton Road and Ellen Street and South Street and Solomon Street and all along the route to Murdoch.